The Nanday Conure is native to South America from South-East Bolivia to South-West Brazil, central Paraguay and northern Argentina, from the region known as the Pantanal. Escaped birds have also established some populations in Los Angeles, California and St. Petersburg, Florida. The bird is mostly green in color and has a characteristic black face and beak. 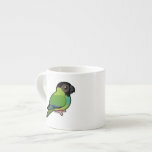 Nanday Conures, also called Black-hooded Parakeets, usually find holes in trees to nest. After raising their young, all birds will form large communal roosts until the next breeding season.